SACRAMENTO, CA -- For the second straight season, the Sacramento Kings are in the uncomfortable position of having to answer questions about the off-court actions of one of their veteran leaders. After spending plenty of time last December on Matt Barnes' arrest and eventual guilty plea for his role in a nightclub skirmish, the Kings were hit with another development Thursday morning. 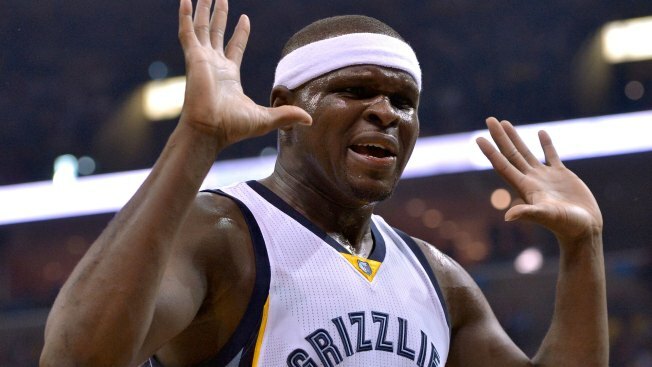 Recently signed big man, Zach Randolph, was booked in a LA County for felony possession of marijuana with the intent to sell. "We are aware of the situation. We have no further comment at this time," the Kings responded when reached for comment. It's not the news that any team wants to wake up to, especially one in rebuild mode. Randolph, a 16-year NBA veteran, signed a two-year, $24 million deal with the Kings in July. Randolph, along with Vince Carter and George Hill were brought in to mentor the young core of the team that includes 10 players with two years or less in the league, five of which are rookies this season. Like Barnes, this isn't the first run in with the law for Randolph. In fact, Randolph has found trouble multiple times in his life dating all the way back to his high school days. He struggled during his time with the Trail Blazers early in his career and there has been concerns over the company he keeps in the past. "As always with Randolph's life away from basketball, you never know the full story and you never knew if it was his fault, or his fault for hanging around the wrong people, or nobody's fault," Jonathan Abrams wrote in his comprehensive piece on Randolph for Grantland in October of 2012. At the time of Abrams piece, Randolph was a 31-year-old player who was entering his 12th season in the NBA. Abrams chronologs Randolph's stops in juvenile detention for a myriad of offenses as a teen, as well as arrests for underage drinking and even a fight with a former teammate during his time in Portland. But by most accounts, the 36-year-old power forward has matured both on and off the court as he made his way through the league. He has become a family man, a respected veteran and according to his agent, the latest snafu is nothing more than a misunderstanding. "The charges are false and misleading," Randolph's agent and attorney Raymond Brothers told the AP on Thursday. "We're looking at all options to resolve this matter." The Kings are at the mercy of the courts and then the league. There are very few options they have in this circumstance until the legal process has moved beyond the initial investigation stage. Like the Barnes situation, Sacramento will likely take a patient approach and wait for more details to emerge. Despite his legal issues last season, Barnes remained with the Kings until the All-Star break when the team cut ties with the veteran wing. They chose to pay out his remaining year and half left on his deal and reboot the locker room down the final 30 games of the season. The Kings are counting on Randolph to mentor their fleet of young bigs, including Skal Labissiere, Harry Giles, Willie Cauley-Stein and Georgios Papagiannis. He is also a player that averaged 14.1 points and 8.2 rebounds in 24.5 minutes per game last season and he is very familiar with head coach Dave Joerger after their time together in Memphis. Sacramento needs Randolph to be both the player and the leader that they hoped they were getting when they handed him $24 million in guaranteed money. His latest entanglement is an unwanted distraction that once again thrusts the franchise into an uncomfortable situation.